The first thing that you notice when driving into the pretty town of Meaford is the large number of structures built from the distinctive red clay brick that was manufactured in the area during the 19th and early 20th centuries. 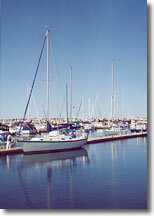 The second thing that you notice is the sparkling blue water of Georgian Bay and the community’s protected harbour where colourful pleasure boats bob in placid waters. Meaford has many claims to fame, one of them apples. The community, nestled on shore the bay, is in the heart of Georgian Bay’s apple growing region. Due to the moderating affects of the lake, a large number of apple orchards are located in the area. Visiting during apple blossom time when the air is faintly scented with the pretty pink/white flowers is an ambrosial experience. 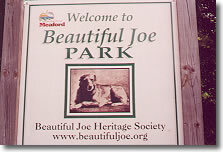 Meaford is also known as the burial place for “Beautiful Joe”, a dog that was immortalized by Margaret Marshall Saunders in her c1893 book of the same name. An 8.3 acre park holds not only a monument to Beautiful Joe but a number of other tributes to dogs and their role in our lives. 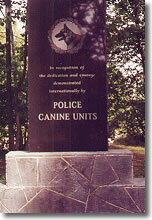 One unforgettable memorial is dedicated to the K-9 units that participated in the search, rescue and recovery missions in the aftermath of 9/11. Another salutes police canine units and a third is dedicated to all assistance animals, those that make lives for the physically- challenged a little easier. Thousands of people attend the Scarecrow Invasion’s Friday evening Parade & Family Festival in Market Square. Children and adults love to dress up as scarecrows. 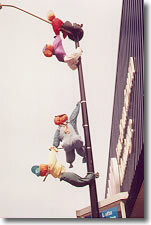 As an added attraction, many carry stuffed and manufactured varieties of the cute figures during Friday evening’s festivities. Weekend activities include harvests dinners, special scarecrow exhibits and contests, pancake breakfasts, a hay maze obstacle course, apple-peeling contest and entertainment for the entire family. Both Scarecrow Invasion and the popular Apple Harvest Craft show are held annual over the first weekend in October. Scarecrows are usually kept on display until after Thanksgiving weekend. A walk around the heritage main street area reveals streets lined with excellent examples of Victorian and Edwardian era buildings, again most of red brick. Look up to appreciate the architectural flourishes that were lavished on some of these buildings. 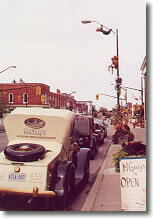 Businesses include antique shops like McGinty’s with its wide selection of collectibles displayed in two stores one of which also houses a café with original tin ceilings, windows and flooring still in place. The most important and unique building in the main area has to be the c1908 Meaford Opera House built in a Neo-classical style with Greco-Roman flourishes. The building stands on the corner of Sykes and Nelson Streets, with the community’s War Memorial by its front entrance. Each summer, the Georgian Theatre Festival has mounted a series of play in the building’s second floor auditorium/opera house which during Y2005 is undergoing a sympathetic restoration. It speaks well of townsfolk that they had the foresight to preserve the building, and to utilize the theatre’s excellent acoustics and 350 seat capacity to benefit the community. Another architectural gem, Meaford’s original fire house, built of the same red clay brick, sits directly behind the Opera House. The building with its huge red doors and tall hose & bell tower still intact is one of the finest intact fire houses in Ontario. Many people travel to Meaford specifically to view the Memorial Windows at Christ Church Anglican. As a Second World War military chaplain, Rev. Harold Appleyard began to collect shards of stained glass from windows of war ravaged churches in southern England. In co-operation with an English architect G.S. Sherrin and the Cox & Barnard Stained Glass Works in Howe, Sussex, a plan was devised to use the glass in windows at Christ Church in Meaford. Cox donated his work in gratitude for the Canadian war effort. The Big Head River begins in the high country inland from Meaford and gathers speed as it flows through its lush valley toward Georgian Bay. The river can be seen from a number of vantage points. Have staff mark them for you on the handy map given out at the Big Apple Information Centre located on Sykes Street, right beside the Opera House. If you visit in September watch for salmon and lake trout moving upriver to spawn. Waters of the Big Head River are so clear that you can see these huge fish quite well from any of the bridges. Fishing is good too. While at the Big Apple, ask for a detailed map of Grey County so that you can fully explore this gorgeous part of Ontario. The valleys of the Big Head and Beaver Rivers are spectacular in their autumn foliage. Hungry? Head for Fisherman’s Wharf by the harbour which has a cozy atmosphere and serves excellent fish dishes. For a lighter meal, try their seafood salad. The Wharf’s Fish & Chips are excellent as are their splake dinners. Adrianna’s Tearoom Café is located in a c1900 heritage building on Trowbridge, just off Sykes Street. High tea and light meals are served in grand British tradition in this gracious former doctor’s home. Original woodwork and stained glass windows grace two dining areas. Tables are beautifully set. Waitresses are appropriately dressed in period costume. Try the café’s signature dishes - Carrot Mango Soup, Seafood Quiche and Hawaiian Chicken Salad plate topped off with a piece of Adrianna’s teacake served with lemon sauce & whipped cream. Desserts are all homemade. Don’t forget that “spot of tea”. At least twenty different varieties are listed on the menu. A side trip to Clarksburg is a must for bridge afficionados. One of Ontario’s unique heritage bridges, built in 1923, crosses the Beaver River in this small community. The concrete bowstring structure was restored during the 1990's and stands as testimony to a man by the name of Charlie Mattaini who, through these gorgeous structures that were inspired by arched architecture in his homeland, northern Italy, left a lasting gift for Canadians. Clarksburg is right next to Thornbury, which sits next to Collingwood and Wasaga Beach so there’s lots to see and do in the area. If visiting in the autumn, check out the fish ladder in Thornbury. Step back into time with a visit Rocklyn, a quanti-essential crossroads community located in high country a few miles south of Meaford. Friendly folks in Rocklyn like to say that a “less than one hundred people”call the community home. Rocklyn General Store is famous for its home-made sandwiches, date squares, brownies, cookies, carrot cake and pies - peach when the fruit is in season, is a favourite. Therisa’s apple pie is ambrosial, especially with a good cup of coffee. Sharing the four corners are an original c1860's stage coach inn, now Rocklyn Inn B & B, a red brick church manse and a stone blacksmith’s shop. The c1886 Town Hall, now a private residence is almost opposite the blacksmith shop. So many of these crossroads communities have been neglected or destroyed by road widening projects that it’s a pleasure to find one that is still reasonably intact. Another village that warrants a visit is Walter’s Falls, with its famous cascade that tumbles over the Niagara Escarpment into the Big Head River Valley. Just getting to Walter’s Falls can be fun if you choose to take the scenic route. While driving through the rolling, forested hills, watch for wild turkey, deer, stone and stump fences, log settler’s cabins and lovely fieldstone farmhouses. Staying overnight? If visiting during the Scarecrow Invasion, it’s best to reserve a room well in advance of the first Saturday in October. Consider Maplewood Bed & Breakfast, a classy accommodation located a few miles east of the town, off Highway #26. The drive along a narrow country lane that meanders through untouched escarpment lands opens onto a high meadow where a brand new home built in Victorian style with Queen Anne flourishes, sits on the heights overlooking the Big Head River Valley. Maplewood Bed & Breakfast is open year round and close to all amenities including cycling, cross country skiing, snowshoeing, hiking the Bruce Trail, fishing, live theatre, unique festivals and lighthouse tours. Guaranteed that you’ll leave just a little bit of your heart in Grey County!